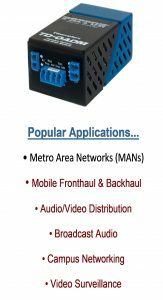 Increase Fiber Capacity with WDM Infrastructure Segmentation | Northmar, Inc.
Did you know you can converge, transport and drop all kinds of voice, video, audio and Ethernet traffic over ONE FIBER PAIR? The new Patton FiberPlex TD-OADM leverages wavelength multiplexing (WDM) so you can split out (drop/add) separate channels at multiple locations without sacrificing bandwidth. You can build up to 16 point-to-point data tunnels, carrying different kinds of traffic, over a single fiber pair. Diverse legacy equipment and modern all-IP solutions can all share the same fiber plant across multiple communication domains. Datacom, telecom, pro-AV, broadcast, network-protection and IoT disciplines need not to build and maintain individual fiber cable plants for transport. This shared-infrastructure approach saves money and increases efficiency. The FiberPlex TD-OADM is an optical add/drop mux used in wavelength-division multiplexing (WDM) systems for multiplexing and routing different channels of light into or out of a single mode fiber (SMF). A dedicated wavelength is assigned to any kind of voice, video or network traffic.